President Paul Kagame has called for consistency in the African Union's reform process, urging leaders not to be fearful of change as it would be counterproductive. "Our objective was to continue building a stronger and more capable African Union that is able to deliver on the pillars of Agenda 2063, and better represent Africa's interests on the global stage. The steps forward that were achieved reflect the long-standing commitment and aspirations of Africa's leaders and citizens. The CFTA was signed, and now, less than one year later, it stands only weeks away from entry into force," he said. "We should not fear these changes, or attempt to delay them. That would be futile and counter-productive. They are the engines of productivity and prosperity for our youth. 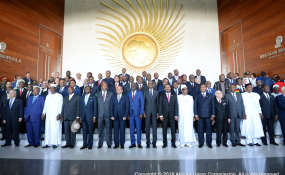 But in order to secure our place, we must face the world as a unified bloc, and work closely with other regional organisations and the private sector, to ensure that the rights and interests of Africans are guaranteed," the outgoing African Union Chairperson said. "What is critical at this juncture is to sustain this good momentum and remain much more and better focused on results," he said. "The consultative process on the reform of the African Union Organs continues. Several Organs have already provided detailed recommendations to the Commission, for which we are appreciative," he added. During Kagame's tenure, the continent made progress in aspects such as launch of the Peace Fund, signing of the African Continental Free Trade Area, increased partnership with international organisations such as United Nations and European Union, and increased financial contribution by member states among others. Prior to the opening ceremony, President Kagame joined fellow Heads of State and Government for the unveiling of the Statue of Emperor Haile Selassie. The commemorative statue of Emperor Haile Selassie serves to recognise the Emperor's contribution to Africa's liberation and unity leading up to the founding of the Organization of African Unity in 1963.